I find tombstones to be irresistible any time of the year. 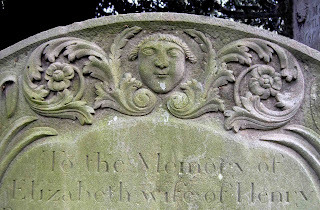 The carved names and dates, the flowers, skeletons and angels are enduring examples of the work of long-gone craftsmen. The disembodied heads seem especially appropriate for the week of Halloween and Day of the Dead. 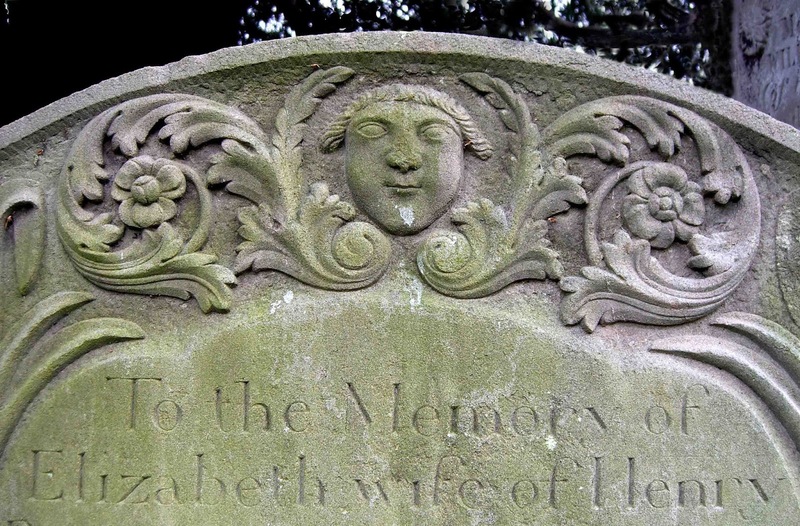 This is one of my favorites, languishing in a church cemetery in Much Marcle, England. A good-natured face floats amidst the scrolling foliage. The carving has a distinctly folk art feel to it. The hairdo reminds me of the wigs worn by British barristers. Perhaps it is an ancestor of the legendary Horace Rumpole who argued cases at the Old Bailey.